Hikanoo will layout and produce an Email Invitation for use as a Marketing giveaway for potential visitors to their website. Included in the development is an Outbound Email Message, Sign Up Page w/ Form Fields for Registration, Terms and Conditions Page, Thank You Page, Email Confirmation Message System, Sign on a Friend Page, and a Pop-up Window upon entry to the site. 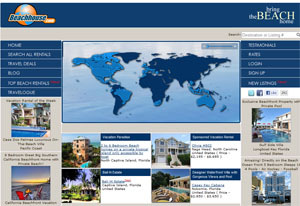 Beachhouse.com lists beachfront properties to buy or lease worldwide. It lists properties for sale and for rent, and the cost is determined by what level of presentation the real estate client desires (Basic, Mid-Range, High End).